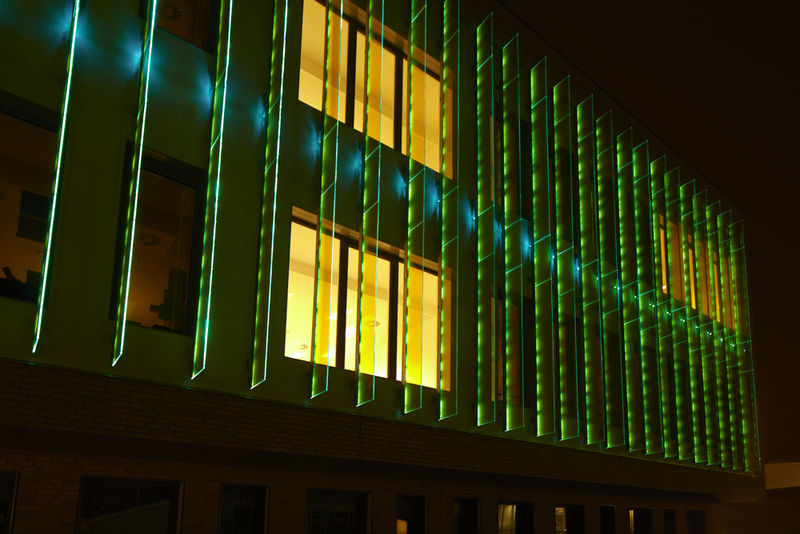 The Aarhus University School of Engineering in Denmark recently moved to the city district of Katrinebjerg, the center of information technology in Aarhus, and sought to announce its new domicile by dynamically illuminating panes of laminated glass on the building’s façade. Using Martin LED strip lights to backlight 24 panes of glass that operate as sun shades, the building, designed by architectural firm CF Møller A/S, now radiates in a wash of eye-catching color that has announced the Engineering School’s arrival as a dynamic, new member of the neighborhood. Control of the lighting system is via a Martin software-based M-PC™ controller, which allows for programming and simple control of a series of custom light scenes. The client is reportedly happy and quite satisfied with the result, a dynamic lighting solution that students have also found useful in their daily studies.